The Little Cowpuncher newspapers are reproduced here complete and unedited. They offer a fascinating and valuable insight into the culture and values of mid-20th century rural Arizona from the perspective a several groups of elementary school students. However, they reflect the moral and ethnic viewpoints of their time and may not be considered appropriate for use in a modern elementary school setting. School on the Range: The Little Cowpuncher Roundup is an oral history project sponsored by the University of Arizona and the Arizona Humanities Council. The project includes videos of interviews with former Little Cowpunchers. Little Cowpuncher was the name of a mimeographed school newspaper, written and illustrated by Anglo and Mexican-American ranch children. It appeared from 1932 to 1943 at five different rural schools in Southern Arizona, where Eulalia Bourne was the teacher. Most of the students who attended these one- or two-room schoolhouses, close to the Mexican border, were bilingual and bicultural. Some were the sons and daughters of pioneer Mexican and American ranch families; others were children of ranch hands working for large landowners; and a few were temporary students from families living on mining claims or road camps. Their original and unedited stories and drawings vividly describe their lives on isolated ranches, and the everyday and special events throughout the school year at Redington, Baboquivari, Sasco, San Fernando, and Sopori schools. On this site you will find Little Cowpuncher online, looking as much like the originals as possible. Sets of the actual newspapers are in the Special Collections Room at the University of Arizona Library, as well as The Arizona Historical Society, both located in Tucson, Arizona. Photo courtesy of the Arizona Historical Society. 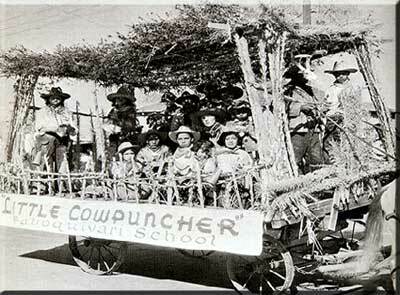 This is the entire Baboquivari School riding in the Rodeo Parade in Tucson, Arizona in February of 1936. Read what they wrote about that day in the Little Cowpuncher by going to: Baboquívari School, 2/27/36 "After the Rodeo Supplement."